Sister Geralda’s parents Arthur and Ethel Lamping were married in 1905 and were models of generosity in raising twelve children in Chicago, Illinois. The Lampings gave three daughters to the Sisters of the Holy Cross. Sister Geralda, the oldest, Sister Alice, who died in 2017, and the youngest, Sister Mary Ann, who survives all of her siblings. These quotations perfectly describe the family life of the Lampings. From a very young age the Lamping children learned generosity and self-sacrifice. Their mother denied the family was poor, stating instead, “we never had anything.” During the depression when money was scarce and the larder was empty Ethel Lamping took her wedding ring to the pawn shop. She used the money she received for food for the family. At a much later date Mr. Lamping bought his wife a new ring. 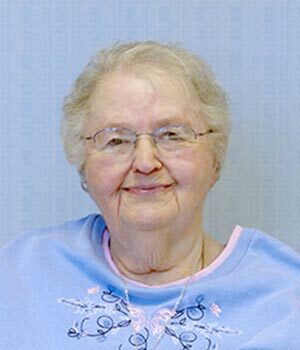 Sister Geralda was born on April 9, 1922, and was named Ethel after her mother. Her mother always told with great pride that Ethel was so healthy and beautiful as a newborn that the nurses at Mercy Hospital used her to demonstrate baby care to the new mothers. 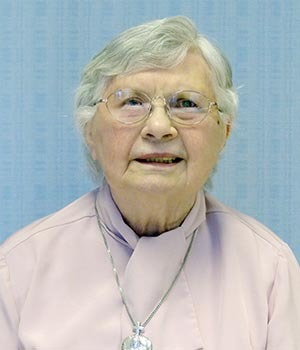 When Ethel was in the sixth grade, the family moved to Saint Theodore Parish in Chicago where she met the Sisters of the Holy Cross and the wonderful pastor, Father Kearns, who was the nephew of Sister Theodore Kearns, CSC. With the care and holiness of the sisters and Father Kearns the Lamping family life was centered in the church, the parish life and the school. At the time of sister’s reception of the holy habit, August 15, 1940, she expressed her desire to be a missionary abroad. 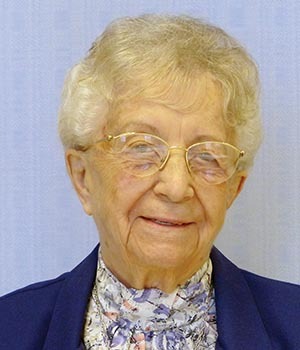 Sister Geralda was trained to be an elementary teacher instead and served in classrooms in Catholic schools in Illinois, Indiana and Michigan from 1942 to 1969. She also spent nine years serving as a superior/principal. 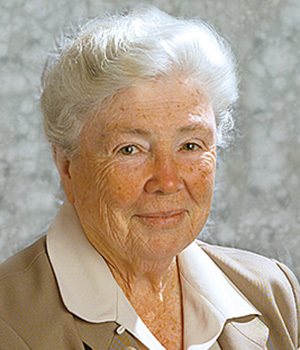 Her gifts for special education were affirmed and she attended Cardinal Stritch College in Milwaukee, Wisconsin, where she earned a master’s degree in 1969. 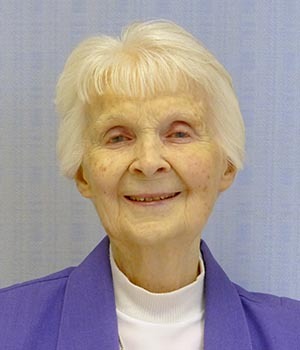 She and Sister Janice Zwickl received training in methods to teach the blind and hearing impaired. 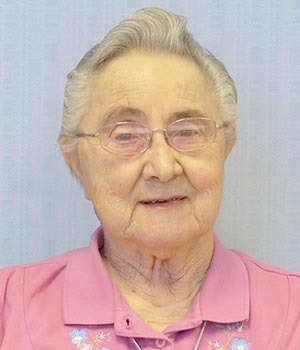 Sister Geralda was a special education teacher from 1969 to 1978 in public school programs in Danville, Illinois, and Munster, Indiana. At age 55 Geralda applied to serve in Bangladesh teaching English to young children. She was shocked when she was accepted because, in her words, “I was never able to learn a foreign language well.” Her perseverance and love for God’s little ones helped her connect with the primary students. She served in Dacca (now Dhaka), Bangladesh, from 1978 to 1982 fulfilling her lifelong dream of being a missionary. 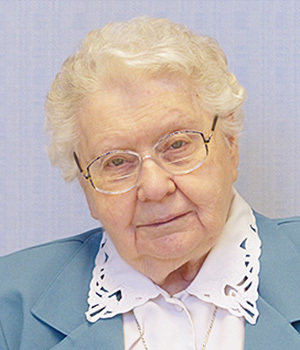 Health issues brought Sister Geralda back home where she served as a parish visitor to the elderly in Streator and Morris, Illinois, until 1995. 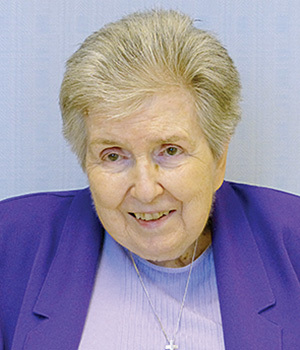 In 2005, Sister Geralda moved to the motherhouse at Saint Mary’s where her missionary outreach and prayer continued. The three Lamping sisters Geralda, Alice and Mary Ann would sit together every weekend and make rosaries. Children living wherever Holy Cross Sisters minister received these rosaries handmade by the Lamping sisters. Sister Geralda loved to sing. One of her loveliest memories of the time she spent in Dacca (now Dhaka), a city in a predominantly Muslim country, was hearing the girls sing parts of the Koran as their prayer. Sister often sang along to music on the television especially Global Catholic Network EWTN. She also loved to sing in the shower. She probably knew every Marian hymn ever written. 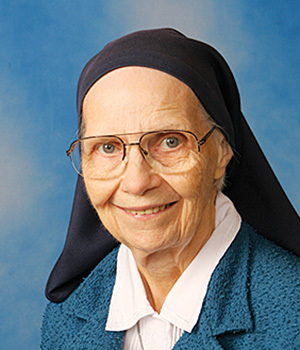 Sister Geralda is now surely singing with the heavenly choir in praise of the compassionate God of all. Memorial contributions may be made to the Sisters of the Holy Cross Ministry With the Poor Fund, Saint Mary’s, Notre Dame, IN 46556. Memento given at memorial mass by Sister Suzanne Patterson, with stories/text received from several sources.